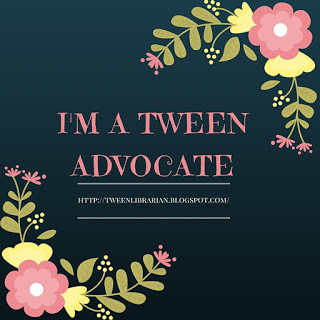 Tween Tuesday is a feature I started to highlight tween titles! First off, I love the title for this one. I agree!!! I admit, if there's an animal on the cover, I have to check the end to see if it's still alive before I can read it. Wallace Wallace (yep, that's his name!) can't tell a lie. When his english teachers asks him to write a book review on Old Shep, My Pal, Wallace can't lie and has to let his teacher know just how much he hated this book. That lands him in dentention and also get Wallace involved in the school play, an adaptation of Old Shep, My Pal. Wallace starts to suggest changes for the show and it'll be one memorable school play! This one had that trademark Gordon Korman humor and I laughed throughout. With the mix of sports and drama, I think it would make a good read for Glee fans, although much tamer, of course. The english teacher was a bit annoying-he needed to lighten up a bit-but he came around and I liked him in the end. (Honestly, I thought Wallace gave a great review from the start!) This one will have you laughing, especially if you've been forced to read those animal classics in school. I'm happy to report, no dead dogs in this one either! Winn-Dixie is a stray dog found by Op al. Winn Dixie connects Opal with the people in her town and she makes new friends and learns to find her place in the world. I like what Publisher's Weekly said about this one-"each chapter possesses an arc of its own and reads almost like a short story in its completeness." That's exactly how I felt this one read. Each chapter was a mini-story. This book was a delight from start to finish. No dead dogs (yay!) and even though there's been tragedy in the characters lives, it doesn't weigh down the story, which I really appreciated. The Miraculous Journey of Edward Tulane is still my favorite Kate DiCamillo novel, but Winn Dixie rivals it closely! Yay for keeping the literary dogs alive! I work with a librarian who won't read any books with dogs unless someone else has read it first and can assure her the dogs are okay at the end. Because of Winn-Dixie is fantastic, and my MC is reading it in my manuscript. 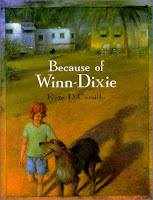 Because of Winn Dixie is one of my favorite books ever! I've read it aloud to my students before, and they actually enjoy it even tho its not an action pack book. Also - the movie made out of it is good too. I don't say that too often, but I did like the movie too. I love this feature -- gives me great ideas for our Tween Book Discussion program at the library!